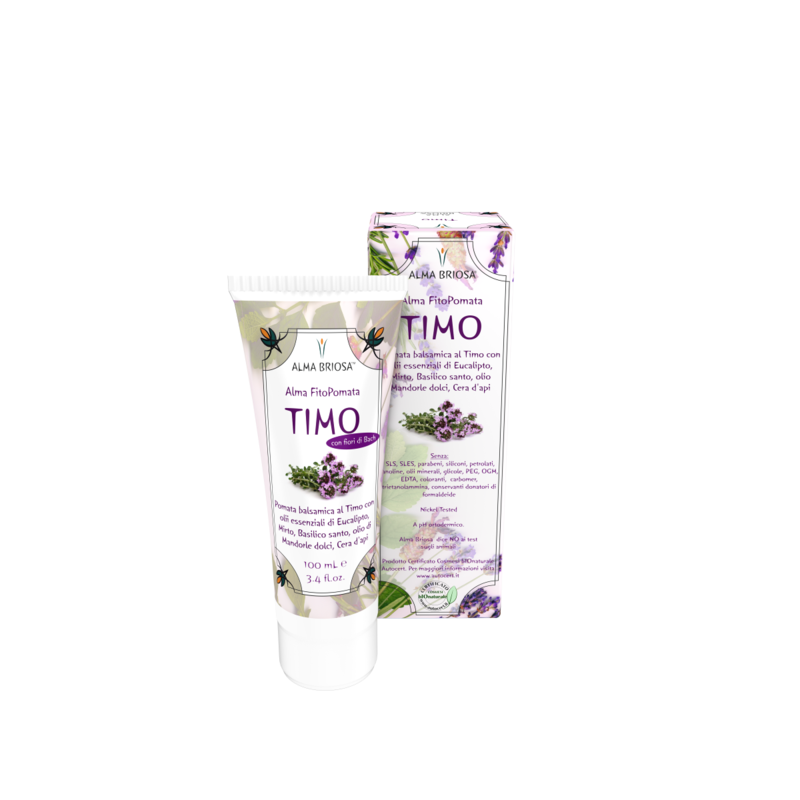 This ointment is made of beeswax and precious balsamic extracts, such as Thyme, Eucalyptus and Myrtle. Holy basil, also known as Tulsi in Ayurvedic medicine, plays an anti-bacterial and purifying role on the epidermis. Beeswax provides proper skin nourishment and soothe redness on nose and lips in case of cold. The ointment contains a floritherapic mixture, prepared with Dr. Bach’s methodology. It serves to alleviate emotional and psychosomatic uneasiness. The action of herbal extracts mixed with Dr. Bach’s remedies resolves both physical and emotional imbalances. Floritherapic mixture used: Centaury, Cherry Plum, Chestnut Bud, Chicory, Vervain. Use: apply a generous amount on chest, feet soles, lips, and nose several times a day. INCI	 INGREDIENTI/INGREDIENTS: Aqua**; Glyceryl Stearate SE**; Glycerin**; Prunus Amygdalus Dulcis (Sweet Almond) Oil*/**; Thymus Vulgaris Extract**; Bisabolol**; Caprylic/Capric Triglyceride**; Sodium Cetearyl Sulfate**; Cetearyl Alcohol**; Beeswax**; Ocimum Sanctum Leaf Extract**; Vitis Vinifera (Grape) Seed Oil**; Glyceryl Stearate**; Eucaliptus Globulus Leaf Oil**; Myrtus Communis Oil**; Thymus Vulgaris (Thime) Oil**; Centaurium Erythraea (Centaury) Flower Extract**; Prunus Cerasus (Cherry Plum) Flower Extract**; Aesculus Hippocastanum (Chestnut Bud) Bud Extract**; Cichorium Intybus (Chicory) Flower Extract**; Verbena Officinalis (Vervain) Flower Extract**; Benzyl Alcohol; Potassium Sorbate; Xanthan Gum**; Limonene**.